Rescue services in England and Wales are to receive funding to help equip and train local flood rescue teams. The money will help local flood resilience teams’ efforts to raise money to buy everything from boats and flood barriers to training sessions for flood rescue volunteers. “We have learnt from the floods we have experienced in recent years that the emergency response is most effective when public, private and voluntary groups work well together - and we saw this week in Cornwall how important it is for these groups to have well rehearsed plans in place. All the equipment bought with the new money will be added to the National Asset Register of emergency resources that others can call upon in the event of a major flood. 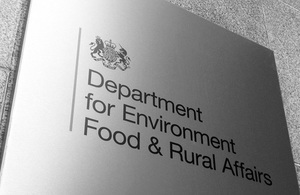 Applications for the remaining funding can be made to Defra until 31 January 2011. The successful applicants were announced at a flood emergency response exercise at Hawley Lake in Hampshire, which involved fire and rescue crews, police, Army personnel and the Environment Agency. The event marks the launch of preparations for Exercise Watermark, a week-long national flood emergency exercise which takes place in March next year involving all Government departments. “Exercise Watermark stems from Sir Michael Pitt’s recommendations following the 2007 floods which caused so much devastation and heartache. The government is committed to implementing those recommendations and working with communities to minimise the risks to people’s lives and their livelihoods. Humberside Fire and Rescue Service (FRS) will receive £125,000 to provide four Powered Boat Teams for national use. Hampshire FRS will receive £117,000 to provide 2 Powered Boat Teams for national use. Devon and Somerset FRS will receive £75,000 to upgrade their assets to four Powered Boats. West Yorkshire FRS will receive £30,000 to upgrade their assets to Powered Boats. Northamptonshire FRS will receive £100,000 to provide two Powered Boat teams for national use. The RNLI will receive £126,000 to support 16 Powered Boat Teams for national deployment in a flooding emergency. Nottinghamshire Police will receive £26,000 for training and equipment for their Dive/Search/Flood Rescue Team, which will be deployed across the Midlands. British Red Cross to receive £25,000 to support the maintenance costs of Bedford trucks, and training and equipment for individuals within the organisation. Exercise Watermark is a national emergency flooding exercise organised by Defra and the Welsh Assembly Government that will take place on 4-11 March 2011. The exercise will test the arrangements across England and Wales to respond to severe, wide-area flooding. It will be one of the biggest exercises to take place in the UK. The national exercise will be supported by regional exercises and locally based community activities. More information on Exercise Watermark can be found at www.exercisewatermark.co.uk.